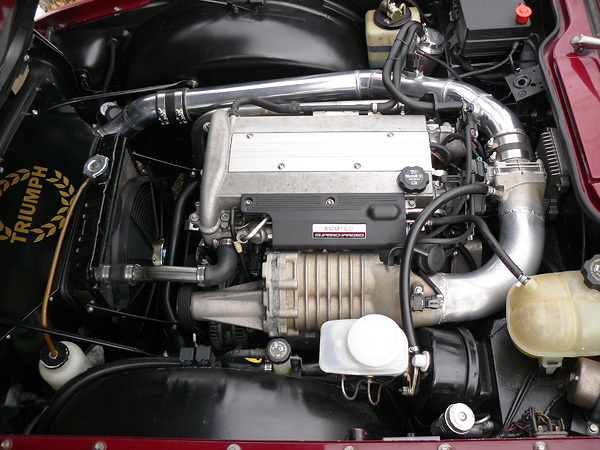 Al Gary chose the supercharged version of Chevy's Ecotec LSJ engine for his 1971 Triumph TR-6. At the rear wheels, he's getting 219 horsepower and 213 foot-pounds of very usable torque from a lightweight little engine that fits neatly, looks sharp, delivers great fuel economy, and meets modern emission standards. Very, very nice! Have a look, and let us hear your comments! A lot of unobtrusive and thoughtful engineering in there. So well done, it could be taken for stock. Clean engine bay, no spaghetti. And the trunk fully available for luggage. With the 4.08 rear end, about 23mph/1000 which I reckon has a slight bias towards acceleration, but is still a good ratio for cruising. Personally I'd opt for the soundtrack and impracticalities of a V8, but have to admire what's been done here. It's such a clean setup, nobody's going to believe it isn't factory. It leaves me with mixed feelings, tho. This is Not a criticism, but I want my engine to look like I've done something to it. This one looks, well- perfect! Thank you all for your kind comments. I am reporting that it has been 5 seasons of driving with many road trips to places as Toronto, Maine, Philadelphia, Poconos, day trips through out New England and I have not been left stranded. I have replaced a throttle body with new and presently working on deciphering a reoccurring throttle position sensor (accelerator pedal) failure. I am also deciding on a brake system upgrade. The car is very fast and, with the 4.08 LSD differential and 0.59 5th gear, a very pleasant cruiser. I still have not done a re-spray nor installed a radio. What a wonderful conversion you did! I know it was a lot of work. I love that it looks as if it came that way from the factory,"almost". That is the way I try to do my conversions if possible. Glad you are driving and enjoying the car. Wondering who did the tachometer conversion if not you. Would appreciate their contact information. Thanks. Great conversion. We need more strong 4 cylinder conversions. Hi Guys. I am still having fun in this little car. It is both a hoot and pleasure to drive. If any one has questions, just ask. Edited 1 time(s). Last edit at 06/29/2018 08:02AM by rficalora. Yes, bring it to Dayton! There will be at least 5 other Triumph conversions there that I know of, 3 TR6s, a TR7/8 & a very wide Spitfire.